You are here: Home / Blog / Diet / What is a Flexitarian Diet and Can It Work For Bodybuilding? Just when you thought nutrition couldn’t get any more complicated here comes another trend. Flexitarianism. Flexitarianism is basically being a vegetarian and having your steak too. The aim is to reduce your meat and animal based product intake without the need to eliminate meat products altogether. The idea behind this is that it reduces the impact that the meat industry has on the world and the impact that meat consumption has on your body. It may be arguable that flexitarianism also goes hand in hand with a paleo-esque, hunter-gatherer style diet, where nuts, seeds, fruits would be easier to come by than meat – but that’s a bit of a wooly hypothesis. It’s not a new idea and has been around for 10 or so years but is gaining in popularity with the general clean eating movement where more and more consumers are concerned with how their food is processed and sourced. The population is being more conscious in how the food industry impacts on the environment, and how reducing meat consumption can help decrease our carbon footprint. I’m going to be honest, my motivations are not rooted in doing good by the earth (though that is a billy bonus). My motivations are in reducing my own meat intake and the impact that meat consumption has on my body. There’s a lot of conflicting research around this topic but I’ve read enough to feel that there is a least some negative impact in consuming a high meat diet. At the height of my diet last year I was eating the equivalent of 20 chicken breasts a week and nearly a kilo of beef mince – that’s a fair amount for a little 5ft 1 girly. By the end of the 12 weeks it felt like my body had just had enough. I couldn’t just cut meat out though; as an amateur bodybuilder and avid gym goer I need my protein to help me hit my goals. We’re a household that loves our steaks, briskets and roasted chicken, so the chance of us giving it up entirely was very slim indeed. 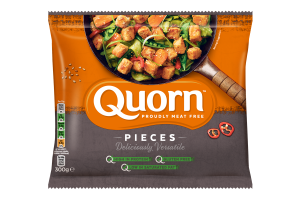 So I started to turn to other protein alternatives, including soy, quorn and other sources of protein such as nuts, seeds and beans. There are some other really cool vegetarian products like sweet potato burgers – but they’re relatively high carb so I tend to stay away from those. I personally think the key of flexitariansim is to be open minded to trying all different types of vegetarian and vegan food and products. I spend time in the vegan and vegetarian aisles checking the labels to see what is highest in protein with low carb/low fat macros. Are you thinking about eating less meat? Have any ideas on how to reduce your intake? Let me know!